Just one random idea: a little something about the world you created for The Iron Seas. I dunno, fanart, some random facts… I actually love to look for fanart of characters and couldn’t find many, it would be great if you had a gallery or something. Oh, thank you! For facts, do you mean beyond those in the series guide? I never thought of a fan art gallery. I’ll definitely ask the artists that have created some if I can use it. Love the new site. I popped over on my iPhone and love how easy it is to get around. Some sites are not great when they are in thier Mobile version. The cover and graphics are very cool. Congrats on the new site! And here’s another idea… an option to subscribe the comments to a post. I have to keep coming here to see if there are any replies, it would be better to receive an e-mail notification. Oh, that is so weird. It was there yesterday when I was playing around with it (below the “post comment” button) but I don’t see the options now. I must have turned them off. I’ll look for them again. Hi – I’ve been wandering around a little. I find the shadow on the smaller headings to cause the text to look blurry, making it harder to read. At one point I thought the top navigation was broken, but realized it was me. I had gone to the Upcoming page. Upcoming was highlighted orange. When I moused over other navigation options, they turned orange but Upcoming was still orange and I thought it had gotten stuck. Then I realized it was orange because it was the page I was on. No need to make changes. Ah, I’ll take out that shadow. Thank you! I love the new design of the website. It is very easy to move around and I can find things quickly. Hi. The new website is great. It’s nice and clean to read on the phone/pad and it’s easy to find info on the books with the side list. Well done, plus I would really love an actual paper copy of your book to pimp out to friends so I can hook them in like I am. Can’t wait for the second book to come out in the iron seas series in June. The site is very easy to use and easy on the eyes. If I can find an author’s books and the connections between them I’m happy, so no complaints here! I do like the idea of fan art. That is so nice…wish mine was. I had fun looking through yours! I spent a little while looking thru the site. I like it, the color is wonderful and it’s very clear and easy to read and navigate. I also found the Hook short so that was a nice surprise. I do agree a fan art page might be nice. Love the new site. Congrats! Great giveaway. thanks for the chance. The new site looks terrific!! And don’t worry too much about people resubscribing for the RSS feed – Google Reader accepted the new site with no hiccups. Congratulations! I recommend this series to EVERYONE and pre-order each new book waaayyyy in advance. Keep up the great writing!!! Yeah, I like the orange, but when it’s on the sidebar it’s a little overwhelming. I might change that to gray or something. Website looks great and can I just say how great it is to see an international book giveaway! So many are only for US/Canadian citizens and I always feel left out here in London, but this makes me so happy I’m tweeting about it 🙂 Thanks for the opportunity to win! I really like the new design and find it easy to navigate and visually appealing. I think the only think I’d add would be a link to “Tethered” on the “books/the-iron-seas” page. Especially when there are novellas or linked stories with a series, I really like having all of the information on all of the associated works together. I think you’ve generally done a great job with this throughout the site, this is the only instance where I’d add the one story back in there so it’s clear that it is an iron seas story, and where it fits. Thanks! Ah, okay. I wasn’t sure what to do with the epilogue novellas yet, especially since they aren’t out in ebook (and I feel kinda sucky advertising them as available when they are only available in print right now.) But I’ll add them to the list there. I love the new site design, it’s got a clean, minimalist vibe to it. It’s nice to have a change of scenery as well. 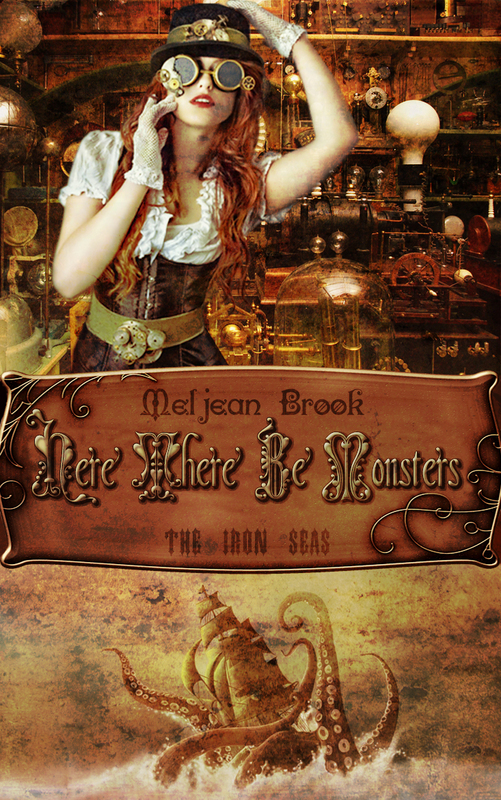 Absolutely love the UK covers for the Iron Seas novels, and can’t wait for Riveted! Heart of Steel was one of my favourite books of last year. First off – LOVED ‘Iron Duke’ the world completely blew me away. Also quite enjoy the new site. Much easier to navigate. The links should all be the same! I think that’s an error from the site propagation (I moved servers, too.) So that should fix itself within 72 hours or so, whenever the DNS info finally updates. There are a few exceptions — I used to be able to quickly link to Riveted’s book page, for example, just with http://meljeanbrook.com/riveted but now I have to use the full link or it redirects to a different page. Others are still the same — like http://meljeanbrook.com/heart-of-steel redirects to the page correctly. But if you usually copy/paste the link from the address bar, it should be okay. I like the new design; it is simple and easy to find things. Nothing worse than an overcrowded site where you have to spend ages trying to find what you are looking for. I love the international covers page. They’re all so different. I personally would like it if the RSS and social media icons were up at the top instead of way down at the bottom. Other than that, it’s a beautiful site — very easy on the eyes and pretty easy to navigate. Lovely design! I’m looking at it on my iPhone and I think it’s great you went with a responsive theme. It looks great on a mobile device. I love the new look! I usually read new posts on Google Reader, but do occasionally pop over and browse the actual site. It’s easy to navigate and has a nice clean look to it. Love the straight forward simplicity of your new site. Your’s was the first Steampunk story I had experienced. Thanks so much for opening up this great new world to me. I’ve been checking every day for your website and wondering what had happened to it. So glad you’re back; I haven’t checked out your new site yet but I will! I came here from Twitter on my Android phone. The site looks great on my mobile device and it loaded quickly. I really appreciate that! I usually read on my rss feed so I don’t remember what it looked like before, but this looks great! Nice and simple! I quite like the color scheme. Love the new site, so clean and uncluttered. Love the British bookcovers too. I think your foreign covers, along with the Riveted cover, would make a great collage. They are all beautiful. The new site looks great! It’s a big improvement overcthe old one which I found a little difficult to navigate. And I agree with AnaA, an area for people to put Fan Art would be a very good idea! Maybe also a parallel gallery for people who make steam punk items to show off their wares? I know there are a lot of steampunk artisans over at Etsy.com and DeviantArt.com who make brilliant stuff that I’m always drooling over and cursing my finances! And thaks for making the draw available world wide. Its always annoying when I see these great giveaways, get excited, and then read the small print and realise it’s only open for Americans, like they’re the only fans that matter! Oh, I don’t know how to do that on this site, because that would require registration of some sort. I’ll have to think of that. I don’t want to open a forum, because they are too unwieldy for me to moderate, and on this site itself, I’m kind of a control freak when it comes to adding content. I’m always happy to link to art, of course, or to upload it here, but I’m a little leery of the anyone being able to add stuff, just because it opens me up to liability issues re: copyright and the like. I’m not sure where to do that. Maybe a flicker account with a specific tag? I’ll look into it. Oops, I linked to the wrong gallery. The link is fixed now. The new site design looks great .Have a fantastic weekend . I like the redecorating. Thanks for the giveaway. Hey love the layout and the colours! the only thing that stands out a bit off( is that too harsh sorry if it is) is the capital lettering on the upcoming page. Everywhere else is normal capitalization. (shrug) But what i like is that everything is easy to find navigation is simple, and there isn’t a Flash based element intro which takes ages to load up! I think the design is nice and clean, and I really like the overall look. Dig the colour scheme. 2) I feel there is a tad too going on on the front page with the big banner, the navigational snippets followed by the blog-bits and footer. The visual way the blog is presented with nice big shiny pictures works really well, but could maybe just use that as the start page under the Blog section in stead? That would leave just the navigational header, banner, info-blocks and footer. Can’t wait for Riveted – I looooove your steampunk! I’m a header-clicker too. Nice point on the blog posts on home page — I’ll see if I can move the query to the top of the blog pages here. I’ll poke around and see what I can do. I kinda new to the whole Steampunk thing. I started with The Internal Devices. Your website looks great. It’s easy to read and navigate through. Thanks! Thanks for the great giveaway. I love the new design! Great site. The simple design makes the great cover art pop! More art would be welcome. Fan or otherwise. It really helps readers visualize the world. BTW, I love the new cover. I loved the old site but this one is gorgeous! Love the clean lines and font and colour choices. Thanks for running a giveaway to celebrate! New site looks good 🙂 Like the colors. Thanks for a chance to win! I always wonder about the “Void where prohibited” fine print, though. Is there actually a place where free books are prohibited, and who would bother to live there anyway? It’s not that free books are prohibited, but that giveaways of this nature might be. I picked the Iron Duke today and finished it in five hours. I love steampunk and I am very excited to read the rest. I haven’t had the time to check much of the website yet, so no comments on that score, sorry. I’ll tell you if I notice anything, but I’d love to win one of the copies, so I have to comment now 😉 Thanks! The site looks very clean and organized to me. I like it. No complaints thus far as I’ve clicked around. I love the new website. It looks awesome! I like the colors and the headers. Thanks for the giveaway. Love the cleaner design and I ADORE the orange (I love orange). Also love when peole have avatars assigned when they don’t have their own. Makes me happy to see pictures. I really like the new site. Its very clean and easy to read and navigate. I love the new site! It looks great, very clean and easy to find information on. I like it quite a bit–and considering that I don’t deal well with change, that’s saying a lot! I think it has everything it should have, but–being a greedy one–I wonder if you would consider at some point adding tidbits about each of the books individually. I mean, in the extras section you mention that “Falling for Anthony” was your THE CALL story. How about mentioning that on that book’s page? (or even in the main series books list) with a link to the blog post? And doing something similar when applicable for each of the books–some interesting factoid or happening related to the writing, the cover design, the release, a signing, what have you. I really like the new look! The only thing it’s missing is books that either you are reading or that you would recommend. I get many of my novel picks from you and other author’s recommendations. Also, can you make the buttons for Facebook and such a little bigger? Can’t seem to find them anywhere… 🙂 Just messing with you! There are a ton of books that I *want* to read, though, if I have time. Maybe I can start posting those. I really like it! The layout is very simple to use and visually it looks great. I haven’t run into any snags yet. Keep up the good work! New reader here. I discovered you through the Vaginal Fantasy book group and I’m very glad for it. I thoroughly enjoyed The Iron Duke, especially your world building. Too often, steam punk is just set dressing in books and really isn’t integrated fully. However, your book was very good and the steam punk was part of the plot and characters! I’m looking forward to reading your other books in the series and the Guardian series (the reason I found your broken link). P.S. The UK Iron Duke cover is much better than the US version. Actually, it looks like most of the links under that header are broken. Ack, thank you! I will go in and fix them. I love the UK covers for your steampunk series! And the new website looks great! I really like the new design. The shadow effect looks blurry to me too, but then again, I probably need to clean my specs. Hmm, I took away the shadow on most of the headers, but I think it’s still here on the blog. I’ll look to see what I can do to remove those on the posts. Okay, yay! Now the only shadow should be on the main/big headings, and not in the blog. The new page looks great – so modern with clean lines and easy navigation! Oh my I can’t believe I almost let this one pass me by!!! I looked thru the comments, good luck everyone but I hope I win!!! From what I’ve seen so far love the new site, easier to get around and the pictures pop! I love the face of your hero on the UK cover! He’s quite scrumptious and worth getting a UK copy, please and thank you!! The new site is ever so easy to navigate and all the colors are much more vivid, so kudos! Some of your older blog posts still link to Odd Shots posts, which has been gone for awhile. I noticed it on the old website so I ran a search for Odd Shots on this one and checked to see if that had changed. Perhaps a disclaimer could be added that it’s no longer available? The layout is great, really easy to navigate. Ah, thanks. Because they’re so old, though, I’ll admit they are a low priority right now. At some point I might be able to remove the links, but that’s a few years’ worth of posts to edit. So that will have to be something I fix down the road, rather than soon. super awesome new design!! i hope its still open..